As I write this, there’s a little bit of a retro-gaming craze going on, with quite a few all-in-one classic video gaming devices on the market – the Intellivision 10-in-1, the Activision 10-in-1, the C64 30-in-1, and the list goes on. The current owners of the Atari brand name (France-based Infogrames) apparently realized “hey, Atari was like, the #1 game maker in the 1970’s and 80’s, maybe people would want to buy some of our older games too” and they went ahead and released the Flashback. It’s not a real “console” and it’s not even a real “Atari” product (for those that don’t know, the original Atari went belly-up some years ago now), though I put it here because it’s just such an odd little machine, and in many ways such a neat little machine, and at the end of the day it is new Atari-branded hardware. I realize this thing is controversial among some collectors. 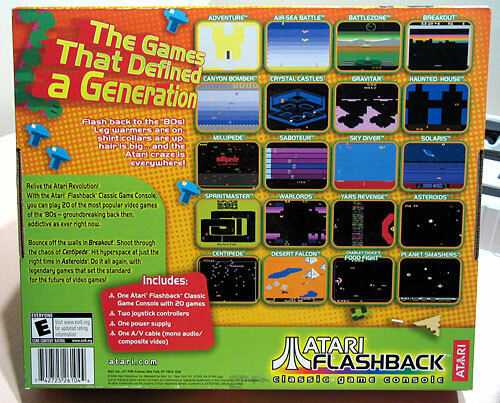 I know that the games it plays aren’t always faithful renditions, I know it doesn’t have a cartridge slot, I know that Infogrames “ripped off” certain imagery that’s copyrighted by third parties for their marketing (I’m willing to bet that was an honest mistake – I think the current Atari design teams just have no clue about what is and what isn’t their intellectual property in regard to classic 2600/7800 stuff). But I still think it’s neat, and I’m glad to have it. I got mine for Christmas 2004 – thanks, bro! 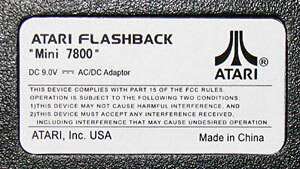 This despite the fact that it contains absolutely no 7800 hardware and is not compatible with the 7800 at all! 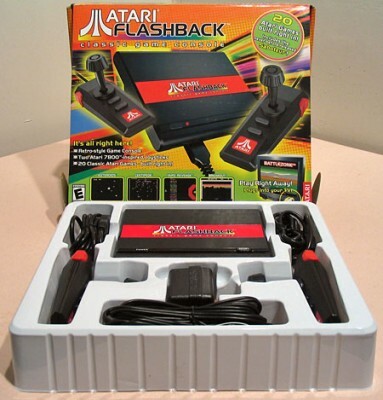 The games the Flashback plays are ported – this is one of the many reverse-engineered NES clones out there, just like most of the other retro-gaming devices on the market. Yes, my hand is right next to the system (it looks some distance in front of it, but that’s an optical illusion). Look at the overlapping shadows. This system is tiny! It easily fits in the palm of my hand. The controllers seem fairly well-designed for an all-in-one unit like this and there are two of them for two player games, which is one more than most manufacturers of this type of retro game machine give you. 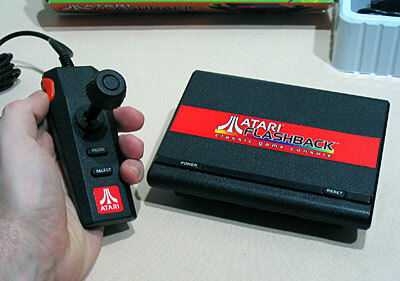 And they do look a lot like real 7800 controllers. They are quite a bit smaller, though, and not that comfortable for me. I have very large hands. One man's humble ode to the history of video gaming.